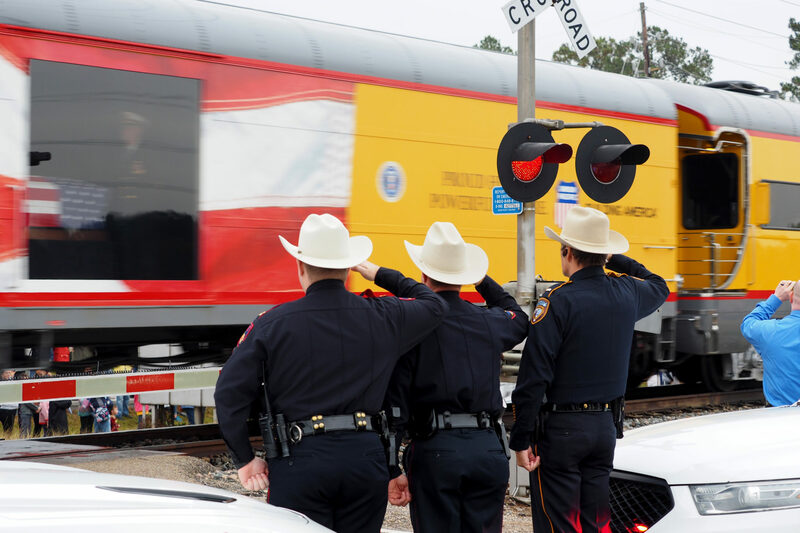 As United Pacific locomotive 4141 made the historic trip to bring President George H. W. Bush to his final resting place, more than 5,000 Klein ISD students were there to take part in the historic and solemn event. Air Force JROTC cadets from Klein Oak High School stood in formation and saluted as the President as the train passed. Klein Oak wind ensemble members also gathered and honored the former President by playing Hail to the Chief. Please click the image below for the full story, photos, and videos. Students at Hildebrandt Intermediate, Northampton Elementary, and Schultz Elementary also took part in the event by lining up along the fence as the train passed by. The origin of Union Pacific locomotive 4141 dates back to 2005 when Union Pacific decided to dedicate a specially painted locomotive to President George H.W. Bush. Its motif was designed to resemble Air Force One and emblazoned with ‘President Bush 41’ and ‘Presidential Library and Museum’ along its sides.